Participants at our 2016 workshop in Chattanooga, TN. Last week we announced the six new communities that will receive one of our free standard technical assistance workshops in 2017. This program, now in its sixth year and funded by the U.S. Environmental Protection Agency’s Office of Sustainable Communities’ Building Blocks for Sustainable Communities Program, has helped more than 70 communities across the country use development strategies to meet their goals. As we look forward to working with next year’s communities, we wanted to take a moment to look back on the diversity of faces and places we’ve visited this year. Kansas City, MO is one of the communities that will receive a 2016 free technical assistance workshop. Smart Growth America is pleased to announce seven communities that have been selected to receive our free technical assistance workshops in 2016. Each year, Smart Growth America makes a limited number of technical assistance workshops available to interested communities at zero cost. This competitive award gives communities a chance to understand the technical aspects of smart growth development and build a strategy to achieve their goals through a one- or two-day workshop on a subject of their choosing. Smart Growth America staff lead a technical assistance workshop in Bentonville, AR. Photo courtesy of the City of Bentonville. Smart Growth America traveled to Bentonville, AR on April 1 and 2, 2015, to hold a workshop for city staff on “Planning for Economic and Fiscal Health.” The workshop, which was part of our 2015 free technical assistance program, was designed to help Bentonville plan for development in ways that support long term prosperity. Bentonville is just beginning the process of updating the city’s comprehensive plan, which will guide development in the city for years to come. City officials will use what they learned in this month’s workshop to inform their work on the comprehensive plan moving forward. Bentonville was one of just 14 communities nationwide awarded a free workshop as part of this competitive program. Bird’s eye view of downtown Hot Springs, AR. Photo by Samuel Grant via Wikipedia Commons. Thanks to its thermal springs and mountainous setting, Hot Springs, AR, has long been a destination for health, wellness, and recreation. Over the years, however, the city has largely built a street network designed for the needs of automobiles—with little regard for the mobility of pedestrians, bicyclists, and transit riders. Now, local officials in Hot Springs are recognizing that prioritizing car and truck travel to the exclusion of these other users has had a significant impact on the health and well-being of its community—and they’re working to make a change. 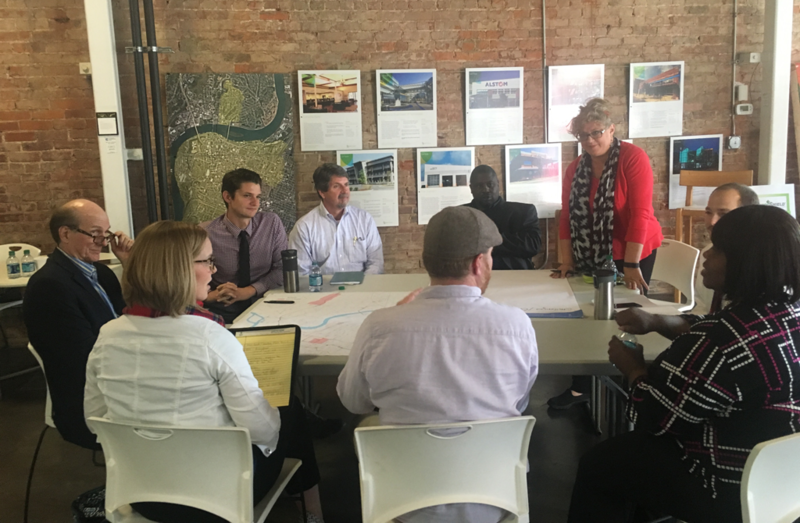 On September 17 and 18, 2014, Smart Growth America visited Hot Springs for a two-day workshop on drafting a Complete Streets policy—a package of codes and laws ensuring that streets are designed for community members of all ages and abilities. Provided as part of a free, grant-funded technical assistance program, the workshop helped provide Hot Springs with the tools to write a comprehensive policy and develop a plan to implement it. The National Complete Streets Coalition reports on the national epidemic of pedestrian fatalities, offering county-, metro-, and state-level data on traffic fatalities and an interactive map of each loss in the decade 2003 through 2012. This resource specific profiles the state of Arkansas. Three areas across the country will receive assistance to implement smart growth strategies from the Environmental Protection Agency (EPA). The State of Rhode Island; Mississippi County, Arkansas and Kelso, Washington hope to strengthen their local economies while protecting public health and the environment through intentional planning efforts. The Main Street to Main Street Multimodal Connector project, a joint regional project between Arkansas and Tennessee, has recently shifted its funding, with $5.6M more going towards Memphis’ downtown development. The money is being re-allocated from Arkansas’ portion of the project. The money is being provided by the Department of Transportation through a fourth-round of TIGER grants. Congressman Steve Cohen (D-Tenn.) lobbied for the funding, saying “The $5.6 million in funds being redirected to Downtown Memphis will play an important role in revitalizing downtown,” after the change had been approved. A new report from Smart Growth America analyzes states’ investments in infrastructure to determine whether they made the best use of their spending based on job creation numbers. Recent Lessons from the Stimulus: Transportation Funding and Job Creation evaluates how successful states have been in creating jobs with their flexible $26.6 billion of transportation funds from the American Reinvestment and Recovery Act (ARRA). Those results should guide governors and other leaders in revitalizing America’s transportation system, maximizing job creation from transportation dollars and rebuilding the economy. According to data sent by the states to Congress, the states that created the most jobs were the ones that invested in public transportation projects and projects that maintained and repaired existing roads and bridges. The states that spent their funds predominantly building new roads and bridges created fewer jobs. Injecting money into transportation projects, the thinking goes, is an especially potent jobs-creation tool because it not only puts construction workers and contractors to work quickly, it also lays the groundwork for future economic growth and development. Obama predicted the transportation money alone would put hundreds of thousands of workers on the job. [S]tates spent more than a third of the money on building new roads—rather than working on public transportation and fixing up existing roads and bridges. The result of the indiscriminate spending? States missed out on potentially thousands of new jobs—and bridges, roads, and overpasses around the country are still crumbling. Meanwhile, the states that did put dollars toward public transportation were richly rewarded: Each dollar used on transit was 75 percent more effective at putting people to work than a dollar used for highway work. From the President down to the Secretary of Transportation, administration officials have spent the year vocally supporting a focus on livability from the federal government — doing what’s in their power to encourage smarter, people-centric planning to create more great places to live where residents have numerous options for getting around and a high quality of life. Perhaps unsurprisingly in this polarized white-hot political era, there’s been a backlash in Congress from some rural legislators. But isn’t livability really a quintessential small-town value? Part two of a personal reflection on small city livability.